Mild conditions which prevailed during December resulted in my best ever catch results for that month at Bawdsey. Good numbers of the regular species put in an appearance; most especially Mottled Umber which was adundant and the not-so-common Scarce Umber. There were a number of late specimens of Dark Arches recorded during the month. Early spring species such as Pale-brindled Beauty and Spring Usher were recorded late in the month – the latter not noted here for a few years. Some recorders thought I was totally crazy operating traps this late in the year. I was hoping for a Red-headed or Black-spotted Chestnut, or a late Oak Rustic. Migrants during December included 133 Diamond-back Moth, 3 Silver Y and 30 Dark Sword-grass. However, the icing on the cake was a fabulous Sword-grass taken on 28 December – a fitting finale to a brilliant mothing year! 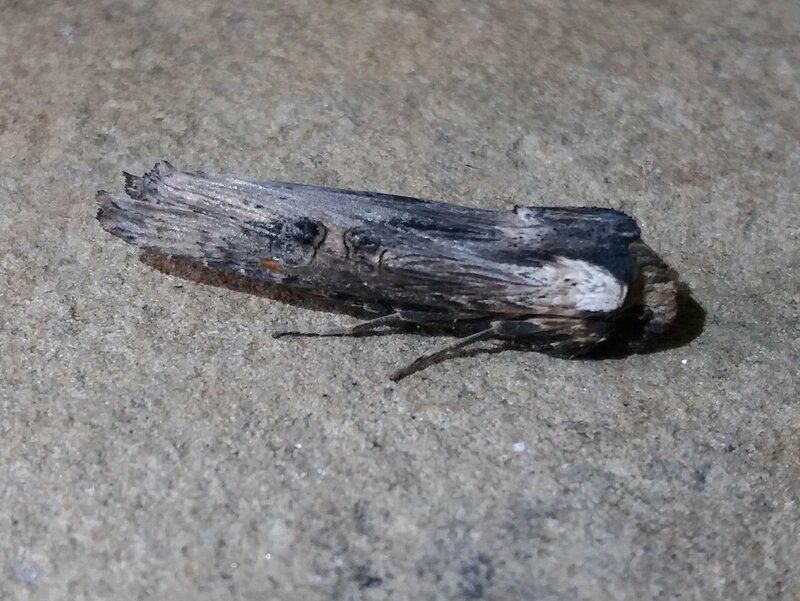 This is the first Sword-grass recorded in Suffolk since one at Reydon, Southwold in September 2003 (which was believed to be the first record since Morley et al). There were eleven additions to the Bawdsey macro-moth list this year including Lesser Treble-bar Aplocera efformata on 13 May, Scarce Merveille du Jour Moma alpium on 31 May, Cream Wave Scopula floslactata on 2 June, Spinach Eulithis mellinata on 29 June, Angle-striped Sallow Enargia paleacea on 3 July, Oak Processionary Thaumetopoea processionea on 24 July, Lace Border Scopula ornata on 25 July, September Thorn Ennomos erosaria on 17 August, Hoary Footman Eilema caniola on 13 September (to be confirmed), Oak Rustic Dryobota labecula on 7 November and the Sword-grass Xylena exsoleta on 28 December. This brings the number of macro-moths recorded at Bawdsey up to an impressive 520 species. There are still some common species to target in 2019. I would like to take this opportunity to wish you all a happy new year and good mothing in 2019! Very good list Matthew. I don’t think there is any time of year not worth trapping, surprises will turn up throughout the year. You need to get into the micros a bit more! My home macro list stands at 458 at the moment which includes Swift, Clearwing. Burnet etc. Happy New Year to you and a successful 2019. I’m on 485 macros now Matthew.